Sally began her yoga practice in 2008 but it wasn’t until after taking Bikram in 2010 that she had found her regular practice. After just ninety minutes of Bikram yoga, Sally instantly fell in love. She realized quickly that she wanted to share this gift with anyone and everyone so she became a devoted student to the practice. In 2011 Sally trained with Bikram Choudhury and became a certified Bikram Yoga instructor in Los Angeles, CA. 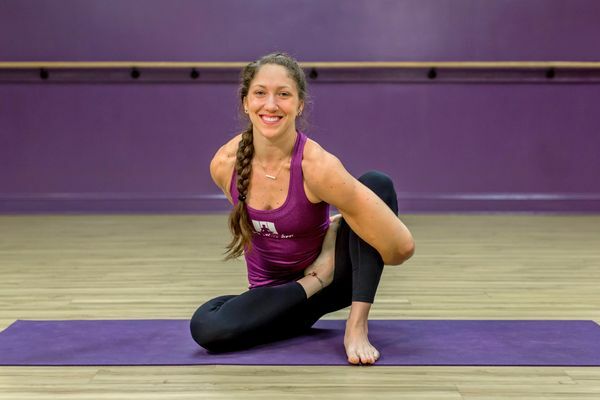 In 2014 she received her 200-hour Vinyasa certification at Full Circle yoga in Boulder, CO. The following year, in 2015, she trained with Corina Benner in NYC and received her Yin Yoga teaching certificate and also trained with Jimmy Barkan in Ft. Lauderdale, FL and received her Barkan Method teaching certificate. Lastly, in 2016 Sally trained with Karli Goering Taylor at The Hot Yoga Spot and became BarreFlow certified. Sally has been teaching regularly since 2011 and is extremely passionate about spreading the love that she has for life and yoga. She is also enthusiastic about travel but always returns to her home, the one and only Capital Region. She loves the challenge that hot yoga presents, pushing past her boundaries and stepping out of her comfort zone. Sally hopes to help you do the same and will always encourage you to find that smile amongst the struggle.